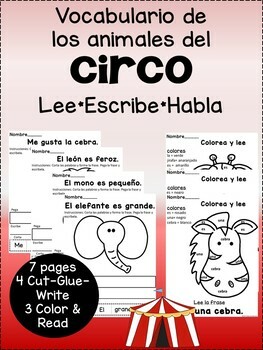 3 Color by Vocabulary Word Sentence Pages ~ a FUN and effective way to reinforce, review and teach vocabulary related to the circus! 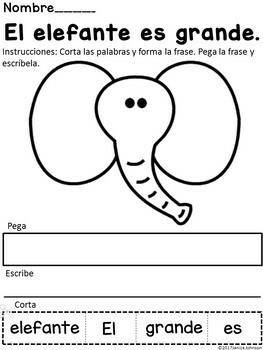 Each coloring page includes a color code for the vocabulary words and a sentence that incorporates the vocabulary from the color code. This gives students the opportunity to practice recognizing vocabulary words and reading them in context. 4 Sentence Forming Pages ~ a great way for kids to work with vocabulary in complete sentences and have fun in the process. Students will cut out the sentence pieces at the bottom of the page, order the pieces to make a complete sentence, paste the sentence in order and write the sentence on the line. Yo soy un mono Reader. 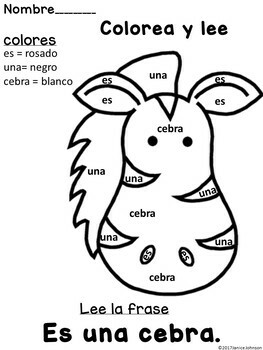 Vocabulario de los animales del mar. This item is also available in French. I will be adding more vocabulary work to my store. To receive notifications as I add products, click the star to follow me.